"Oh do shut up, it's 1346 for goodness sake!" I’m telling you, this had better be the pilot comic for a longer running series or stern words will have to be had! Yes, those maddos at Madius are at it again, this time with a short one-shot comic that they’re launching at Thought Bubble in September (and online shortly thereafter.) I was lucky enough to get an advance sneak peek at it and, honestly, you all need to get this comic when you can… it is brilliant. I’m not going to say anything more about the story because it’s so glorious you HAVE to read it for yourself and I don’t want to spoil it. However, I do want to talk a bit about the cloaked stranger. 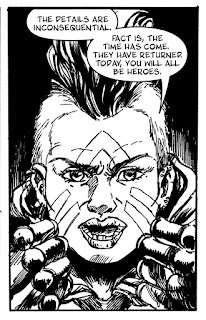 This is Gytha, and she will be your new favourite comic-book hero. She looks like a cross between Tank Girl and Lydia in Skyrim, with the addition of a very cool Assassin’s Creed cloak, but she definitely has an attitude that is 100% her own. Seriously, if I was several decades younger, this would be a cosplay character that I would actually want to do. That look is, I guess, thanks to the stunning artwork by Gustavo Vargas, a comics artist new to me but definitely one I will look out for in the future because his character work is amazing, he can capture so much expression in his faces, and his unusual panel layouts just added to the creativity of the comic. But, as always, the writing is all important for me with a Madius comic. When a new tale springs forth from the minds of Jones and Sambrook you know that, as well as a superb story, there’s going to be a lot of humour in your reading and this time was no exception. 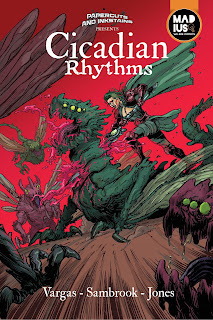 I found there were several laugh out loud statements as well as a generally upbeat flavour to the dialogue and the story, giving the comic the feel of a fun action movie more than a “takes itself far too seriously” high fantasy tale and, for me, it was much more enjoyable because of that. 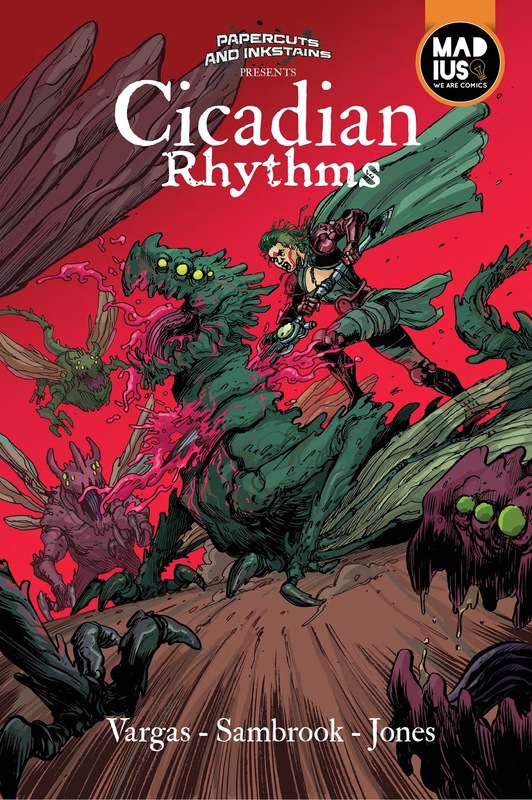 That’s not to say there aren’t swords and dragons in it though, because there are, and you’ll find out that the title Cicadian Rhythms isn’t the typo I initially thought it was; it’s really all very clever as well as very funny.